Darius Jermaine Butler (born March 18, 1986) is an American football free safety who is currently a free agent. He played college football at Connecticut. Butler was drafted by the New England Patriots in the second round of the 2009 NFL Draft. He has also played for the Carolina Panthers and Indianapolis Colts. Butler began his career as a cornerback and before switching to safety in 2016. Butler attended Coral Springs Charter School in Coral Springs, Florida. While there he played quarterback and safety. In addition to football, Butler also ran track and played basketball, scoring over 1,000 points during his career. He was an All-County selection as well as an All-State honorable mention. Butler played college football at the University of Connecticut, where he was a four-year starter and two-year team captain. He was primarily a cornerback, but he also spent time as a kickoff returner and wide receiver. Butler was twice named Big East Player of the Week, both during his freshman year in 2005. He earned Big East Defensive Player of the Week after intercepting three passes for 122 interception return yards and a touchdown in a game against Army on October 1, 2005. The 122 return yards set both a Connecticut and Michie Stadium record. He also was awarded Big East Special Teams Player of the Week after he returned a kick off 90 yards for a touchdown against South Florida on November 26, 2005. After his senior season in 2008, Butler was named to the All-Big East first team, despite not having a single interception all season. Butler finished his career at Connecticut starting 43 of 45 games, recording 180 tackles, 10 interceptions for 213 return yards and two touchdowns. He also scored three other touchdowns: one on a kickoff return, one rushing, and one receiving. Butler was drafted by the New England Patriots in the second round (41st overall) of the 2009 NFL Draft. On July 10, 2009, he signed a four-year contract with the Patriots that included a total of about $2.1 million in guaranteed money. Butler got his first career start and interception against the Tennessee Titans. The following week, he got his second interception against the Tampa Bay Buccaneers. He returned an interception 91 yards for a touchdown against the Houston Texans on January 3, 2010. He finished the season starting five of 14 games played, recording three interceptions, 35 tackles, and eight passes deflected. Butler at Patriots training camp in 2009. In 2010, Butler started the first two games of the season, including a Patriots loss to the New York Jets in Week 2. In the game, Butler gave up a touchdown reception and was also penalized twice for defensive pass interference on another Jets touchdown drive. He was replaced as a starter by Kyle Arrington the next week, and was not part of the team's defensive sub packages. After being a healthy inactive for the team's Week 10 game against the Pittsburgh Steelers, Butler returned to make his third start of the season, as the Patriots' nickel cornerback for their Week 13 win over the Jets. Butler finished the season with three starts in 15 games played, recording 23 tackles and six passes defensed. On September 6, 2011, he was waived by New England. Butler was claimed off waivers by the Carolina Panthers on September 6, 2011. He would appear in 13 games for the Panthers, starting in 6 of them. On August 31, 2012, Butler was waived by the Panthers. Butler was signed as a free agent by the Indianapolis Colts on September 25, 2012. On March 12, 2013, he was re-signed to a two-year contract. Butler signed a new contract extension worth $5 million over two years with the Colts on March 8, 2015. He was named the AFC Defensive Player of the Week for Week 9 of the 2015 NFL season, after recording two tackles, one interception, and one pass defensed in the Colts 27–24 win over the Denver Broncos. Butler switched to safety in 2016, but reverted to cornerback during the season as injuries mounted for the Colts. He then chose to move back safety in 2017. On March 17, 2017, Butler re-signed with the Colts on a one-year deal worth $3 million. He played in 15 games with four starts at free safety for the Colts in 2017. Butler is cousins with Willis McGahee and Bengals defensive tackle Geno Atkins. ^ "Big East Announces 2008 Postseason Football Honors". Big East Conference. December 10, 2008. Archived from the original on May 8, 2009. Retrieved July 27, 2009. ^ Price, Christopher (July 10, 2009). "Butler, Pats agree on four-year deal". WEEI. ^ Reiss, Mike (September 6, 2011). "Patriots release CB Darius Butler". ESPN.com. Retrieved August 17, 2014. ^ "Report: Butler goes to Panthers after being waived by Patriots". NFL.com. September 6, 2011. Retrieved August 16, 2014. ^ Gantt, Darin (August 31, 2012). "Panthers release Darius Butler, former Pats second-rounder". NBCSports.com. Retrieved August 17, 2014. ^ Florio, Mike (March 12, 2013). "Colts keep Darius Butler". NBCSports.com. Retrieved November 28, 2013. ^ Wilkening, Mike (March 8, 2015). "Colts agree with CB Darius Butler". profootballtalk.nbcsports.com. Retrieved March 8, 2015. ^ "Colts CB-Darius Butler named AFC Defensive Player of the Week". colts.com. November 11, 2015. Retrieved November 11, 2015. ^ "Colt's Darius Butler wants to play safety- but for whom?". indystar.com. Retrieved August 1, 2018. ^ Bowen, Kevin (March 17, 2017). "Darius Butler Staying With Colts". Colts.com. ^ "Darius Butler NFL Combine". NFL Events: Combine Player Profile. Retrieved November 9, 2016. 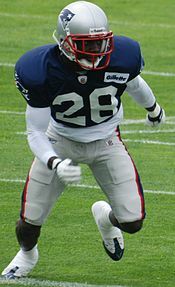 Wikimedia Commons has media related to Darius Butler.